The SircleLam SG-230 pouch laminator is stylish, easy to use and suitable for medium usage in the home or office environments. Designed with four silicon rollers, the SG-230 provides the perfect seal for 3-10 mil pouches. 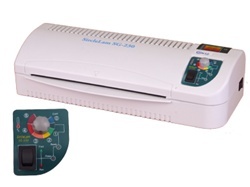 Its variable temperature control incorporates a hot temperature as well as a cold temperature setting to allow for the lamination of temperature sensitive documents.